Taree High School’s Sarah Jane Hammond is the 2018 Lions Club of Taree Youth of the Year and has booked herself a place at the regional final. 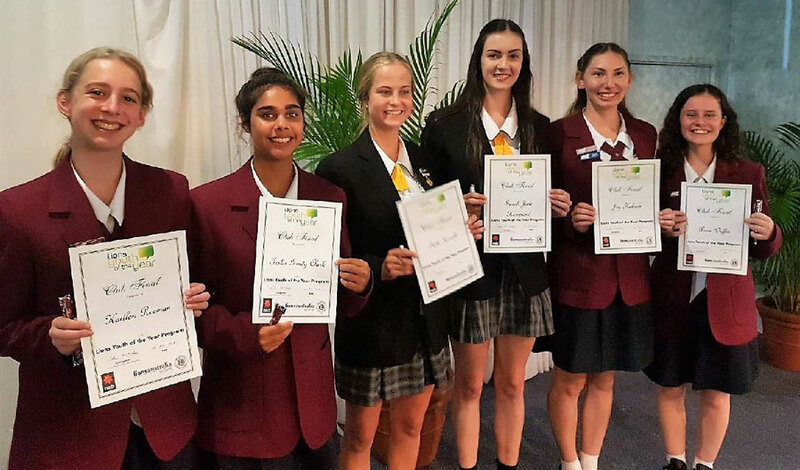 Sarah was one of six students to enter the competition, joining fellow Taree High School student Beth Kerville and Taree Christian College’s Kaitlon Reeman, Iesha Gundy Clark, Joy Hobson and Annie Duffin. All contestants participated in an interview process with judges Toni Fatherley, Paul Ryan and Rob Douglas, where they discussed their contributions to and involvement with leadership, sport, culture, academia, citizenship and community. The students were then judged on their public speaking skills, with two impromptu speeches and one prepared speech in front of family, friends and members of the Lions Club at an event at the Exchange Hotel’s Waterfront room. They had to think on their feet to provide thoughts on whether the three levels of government has allowed Australia to become a “nanny state” and if Australia should become a republic and remove the Queen as head of state. Lions Youth of the Year contestants Kaitlon Reeman, Iesha Gundy Clark, Beth Kerville, Sarah Jane Hammond, Joy Hobson and Annie Duffin. Photo: Phil Grisold. This was then followed by their prepared speeches. Annie gave an inside look into her travels around the world, Joy spoke about the tribulations of students completing the HSC, Iesha shared her experience of travelling to Denmark with the NSW gymnastic performance team, Kaitlon gave her views on the “future of Australia”, Beth provided a youth perspective on social media and how she has changed from removing it from her life and Sarah spoke about her connection to dance as well as performing with the Bangarra Dance company. Sarah was named the winner of this section. Good evening ladies and gentlemen, my name is Sarah Hammond and I am a proud Birripi woman. Tonight I will be discussing how dance has enabled me to gain a better understanding of both myself and others. My love of dance and my cultural experience has brought me a closer understanding of what it means to be indigenous. Movement becomes the language while the body is the medium for a story to emerge. Whether set to music, drums or silence, it evokes a certain power that can only come from the core of the human body to ooze an evocative pathos that cannot be spoken, only felt. Like painting, writing and playing music, dancing is an art – a performing art. It connects us to our capacity to think creatively and our ability to explore self-expression. Moving in time to rhythm and music triggers all kind of inspiration that can apply to other areas of life. I can’t remember a time I wasn’t dancing; it has been a part of my life from such a young age. Starting as a budding ballerina I worked hard to get where I am today. Training five days a week with many different mentors I was able to develop skills within many styles of dance. For me, dance is always a way to express my feelings. I dance because I’m happy. Or because I’m sad. Dance is an art, an outlet, a way to transform my emotions into a beautiful connected movement. Dancing within a group allows me to connect with others at our most vulnerable and create something together. The idea of dance, while is can be purely creative is used as a starting point for practical approaches and experiences of leadership and organisation. Through a focus on contemporary dance my eyes were opened to the power of cultural and traditional dance. Being invited to the workshop with Bangarra Dance Company wasn’t something I saw myself doing. I was so focused on my school work and outside training. My dance teacher encouraged me in what he thought would be a great experience.I’d never done any traditional dancing. This was the beginning of an unforgettable experience. Along with many other Aboriginal students I went along to the work shop. We started off with basic warm-ups finishing with a dance by the end of the day. I was pulled a side by the organiser who informed me that I had been shortlisted out of thousands of dancers to join the Banagarra Youth Program. This was a significant shift that led me to an understanding of how powerful culture is within dance. Having not heard anything for a month I presumed I hadn’t made the company. Within the next couple of days, I received an email stating I had made it! I was then selected as one of twenty-six students to join the company. To be honest, I didn’t know my family history until about three years ago, I had no idea that I was Aboriginal. I thought this opportunity would give me a chance to learn a type of dance about culture. I learnt to respect, understand and embrace my Aboriginality. I am now fortunate enough to have a great appreciation of both white and Aboriginal culture. I spent weeks of intense training and conditioning in Sydney. With a group of young aboriginal people, we all worked towards our performance for the Schools Spectacular, spending hours each day rehearsing. Being a part of this experience allowed me to show other young indigenous and non-indigenous students the power of culture. While it was not my intention to be a leader, I feel my indigenous dance experience allowed me to embrace my culture and share my experiences with young indigenous people showing them the power of passing down culture through generations. Leadership is not about telling others who or what they should be, but helping them to find their voice and the confidence to embrace on the journey. Sometimes all that someone needs is to hear another person’s story or to have someone who believes in them, like my dance teacher did for me, and they can achieve more than they ever imagined. I feel that my ongoing journey through dance has taught me about the benefits of my culture and positive leadership as well as learning about others. It has made me aware of the cultural disadvantages of Aboriginal people and the greater disadvantages of white Aboriginal people. Leadership to acknowledge and develop awareness of cultural gaps in being addressed in one way through traditional dance.